Accidents happen. They come out of the blue, unplanned and unexpected. They disrupt your life, cause injury, and make you painfully aware of your own destructibility. I was at a family party, celebrating the second and fourth birthdays of granddaughters two and three. The family was gathered at my son’s table, finishing lunch and laughing as we visited. In one smooth move, I scooped up the used party plates and was in the process of pivoting around in my chair while standing up, planning to deposit them in the trash container behind me. Instead I landed head-first in my niece’s lap! Somehow I managed to get a foot tangled up with the leg of my chair and the table leg. 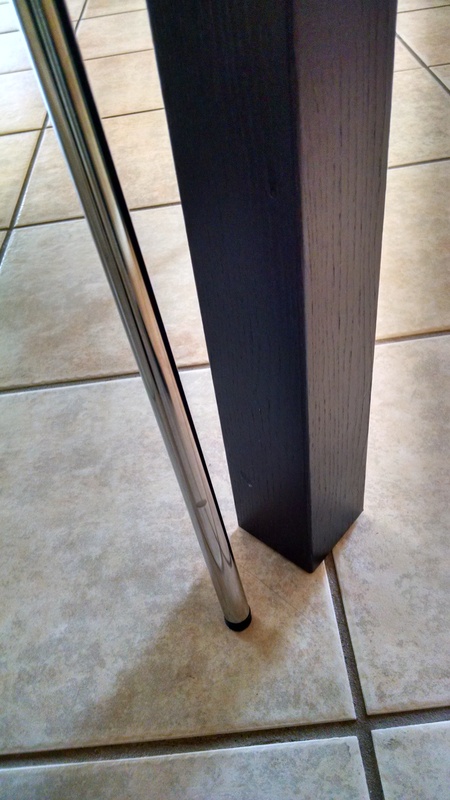 The culprits: chair and table leg. I think I managed to hook my little toe on the aluminum chair leg, bending the last two toes skyward. The remaining toes smashed against the table leg, pressing them downwards. Imagine a circus strongman ripping a phone book in half down the middle. Now exchange the phone book for my foot! My foot immediately inflated and discolored. 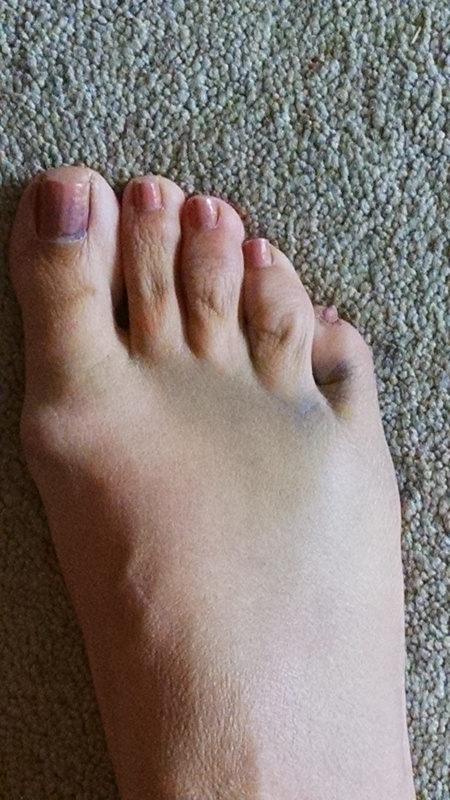 I could still wiggle my toes, so I assumed nothing was broken. It wouldn’t “flex” and I had a funny bump on the sole under my little toe, but I could still put weight on the heel and hobble along. Wearing a shoe was out of the question, but I managed an over-sized flip flop. Wrapping my foot in athletic tape provided some support and helped quell the throbbing pain and the swelling gradually decreased. Tutti-fruity colors; the nail polish is hiding the bruises UNDER the nails. I have broken a toe before and the remedy was to “buddy tape” it to the toe next door. I figured I was in for a long six weeks and was grateful that it happened in the summer so I didn’t have to try to wear real shoes. I slept with it elevated and outside of the covers to avoid the weight of blankets. A nurse friend suggested that I probably should get x-rays and cautioned that if I broke the socket, I might need surgery. I was leaving the next day for a week-long trip and figured I would see a doctor when I got home if it wasn’t any better by the time I returned home. Our first night of the trip was spent at a charming, rustic 1940’s style Lodge on Skyline Drive. No televisions in the room, no a/c, and no elevators! The down comforter on the double bed gave the room a European feel. 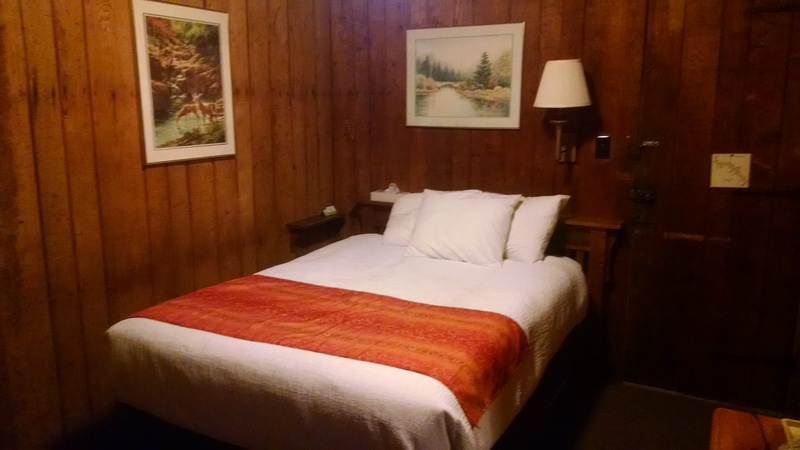 Our charming room at the Lodge. We climbed the steep, double flight of stairs and I hobbled down the hall to our room. The narrow room could only accommodate a full sized bed, instead of a Queen or King, and the right side of the bed was only about a foot from the wall. I opted to sleep on the bathroom side, despite placing my sore foot on the center of the bed. Sometime during the night I woke up yelling and moaning. Deep asleep, I must have gotten my foot wrapped up in the bedding and thrashed it into my husband’s leg as I tried to kick free of the covers. I remember feeling a “POP” as I hit his leg, and a white-hot flash of intense pain. But in the morning, my foot was fine! I suspect I had dislocated my toe in the accident and the night-time impact realigned it. God’s chiropractic adjustment! God restored my foot during the night. The throbbing pain was gone, my foot could flex again and the odd lump under my little toe had vanished. I can walk again! Isaiah 52:7 says “How blessed are the feet of those who bring good news.” One week after the “adjustment,” I am only dealing with minor bruising and muscle strain but am well on the way to full recovery.